Valerie Wathen of Dutton-Goldfield Winery recently hosted me for a vineyards tour with Steve Dutton and a tasting of some current Pinot Noirs. We spent some time at both Emerald Ridge Vineyard and Jentoft Vineyard, both in the Green Valley of Russian River Valley AVA. Emerald Ridge was planted in 2001 to multiple suitable clones and Jentoft to the Calera clone in 2000. As the vineyards have matured, the wines produced from these sites have shown special qualities. Emerald Ridge became a vineyard-designate in 2009 and Jentoft, a component of the special Deviate Sonoma Coast bottling, is now being considered for vineyard-designation. 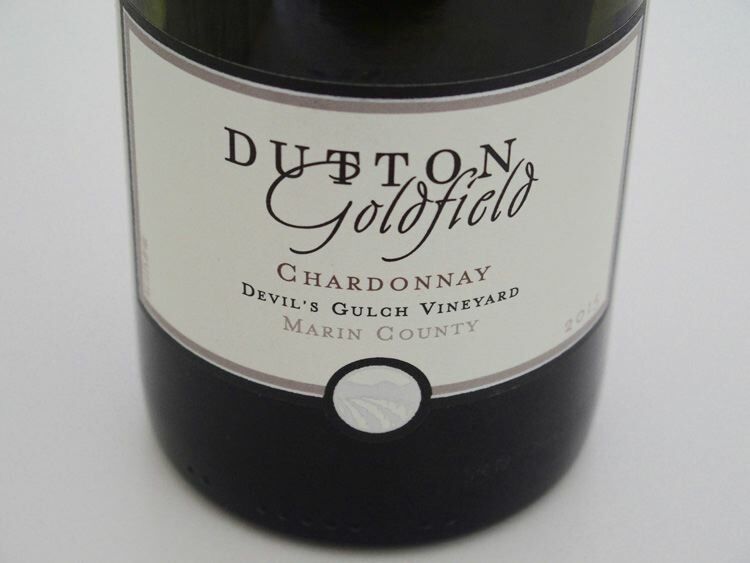 Dutton-Goldfield represents a unique collaboration between fifth-generation farmer, Steve Dutton, and veteran winemaker Dan Goldfield. The two longtime friends and colleagues began their winery with a handshake in a vineyard on 1998. Steve Dutton’s father, Warren Dutton, grew Pinot Noir and Chardonnay beginning in the mid-1960s in the cooler, western part of Sonoma County. Today, along with his brother, Steve manages over 80 separate vineyards comprising more that 1,100 acres. Dan Goldfield graduated from University of California at Davis with an M.S. in Enology in 1986. He went on to earn his winemaking stripes at Robert Mondavi Winery, Schramsberg, eventually finding a passion for Pinot Noir and Chardonnay, and became the winemaker at La Crema Winery and then Hartford Court, which was created under his direction. 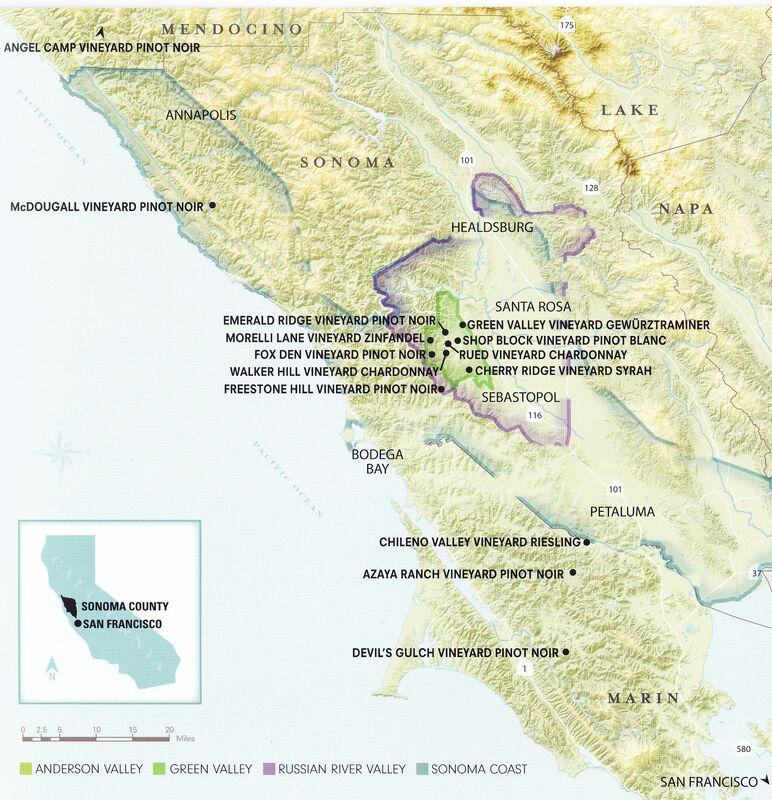 Most of Dutton-Goldfield’s vineyards are located in the Green Valley of Russian River Valley as can be seen in the map below. This area is located in the southwestern portion of the Russian River Valley and is one of the coolest AVAs in Sonoma County. Here, the predominant Goldridge fine sandy loam soils provide excellent drainage and balanced nutrients, and the vines benefit from the cool air and fog from the ocean through the Petaluma Wind Gap. Dutton-Goldfield has a winning formula: carefully selected vineyards most of which are expertly managed by one of the proprietors and meticulous winemaking by the other proprietor who is a veteran of his craft. Visit www.duttongoldfield.com.